Staying at a resort is the most luxurious lodging option on the Big Island. We recommend staying in a resort if you want an ultimately relaxing vacation, and don’t mind paying for it. The resorts on the Kona coast offer on-site luxuries such as relaxing spa’s, world-class golf courses, private swimming pools, and tennis courts. The south Kona coast is not as dry as the Kohala coast to the north, and access to pristine white sand beaches here is not ideal. However, this is easily offset by the lush and tropical nature (lots of Kona coffee! ), proximity to some of the best snorkeling on the Big Island, and, last but not least, the spectacular manta ray night dive. The only resort south of Kona is the Sheraton Keauhou bay resort, 7.5 miles south of Kailua Kona. The Sheraton Keauhou Bay Resort & Spa was build on an ancient lava flow entering the waters along the Kona coast of Hawaii’s Big Island. It offers everything from rejuvenating spa treatments to an entertaining luau. Perhaps most spectacular is the on-ground multi-level fantasy pool: the “Manta Ray Super Slide & Pool”. Situated at the heart of the resort, this enormous fresh-water pool includes its own sandy-bottomed children’s play area, the island’s longest water slide and bubbling whirlpool spas. As an added local bonus, the Sheraton Keauhou hosts the Ho’oulu farmers market every Wednesday on its lawn. 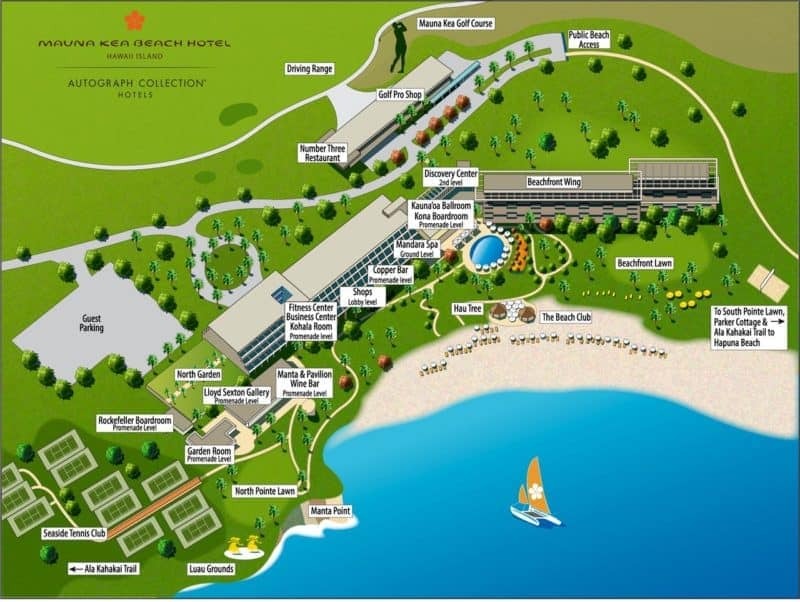 Read more on the Sheraton Keauhou bay website, or see the map below for an impression of the resort grounds and amenities. There is one resort within the Kailua Kona city limits: the Royal Kona resort. Its location is difficult to beat, with great views over Kailua bay and proximity to all of Kona’s activities. The Royal Kona Resort is an architectural marvel set on twelve oceanfront acres overlooking Kailua Bay in the heart of historic Kailua-Kona town on the Big Island of Hawaii. Their on-site recreation includes: a split-level swimming pool, a private saltwater swimming lagoon, the Royal Kona tennis club, a fitness club, a massage and spa center, and the Royal Kona luau. Read more on the Royal Kona resort website, or see the video below for an impression of the resort grounds and amenities. Collection of 2-bedroom bungalows that have been designed to re-create the charming traditional Hawaiian island ambiance found back in the ’30s, with all the modern amenities and activities you would expect in a tropical resort. On-ground amenities include 2 outdoor swimming pools, 2 picnic/BBQ areas, and 2 outdoor hot tubs. The Wyndham is located in Kailua Kona on walking distance from the beaches and 1.2 miles from Kailua bay. Almost all resorts on the Big Island are concentrated on the Kohala coast, north of Kona. This is for one very good reason: weather! It almost never rains here at the Waikoloa and Kohala coast, and the temperatures are pleasant year-round. Add to that pristine white-sand beaches, a few palm trees, and lots of good snorkeling spots, and you have all ingredients for paradise. Kona Village Resort is located on the Kona Coast of the Big Island of Hawaii. It’s perfect for Hawaiian honeymoons, family vacations and executive retreats. Think: private thatched-roof cottages open to the beach and lush lagoons. The Kona village resort has been closed since the march 2011 earthquake. The resort is scheduled to reopen in 2019, you can check their website for the current status. The Four Seasons Resort Hualalai at historic Ka’upulehu offers more than ever to explore – with a newly expanded spa, beachfront dining, fashion boutiques and new deluxe suites. Set on the Big Island’s exclusive Kona-Kohala Coast, this showpiece oceanfront resort captures the essence of Hawaiian design, culture and tradition. The Waikoloa Mariott resort spans 15 acres and faces the beautiful Anaeho’omalu Bay beach and ancient fish ponds. There are various pools on the resort grounds, and the beach is almost as close as the pools. 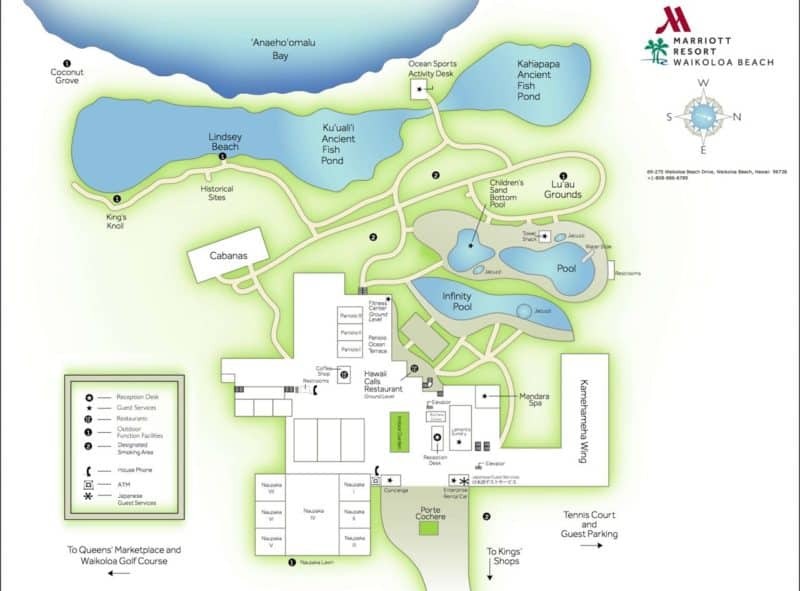 Read more on the Waikoloa Mariott website, or have a look at the resort map (updated March 2017) below. The Hilton resort is located in the Waikoloa Beach Resort on the Kohala Coast of Hawaii’s Big Island. 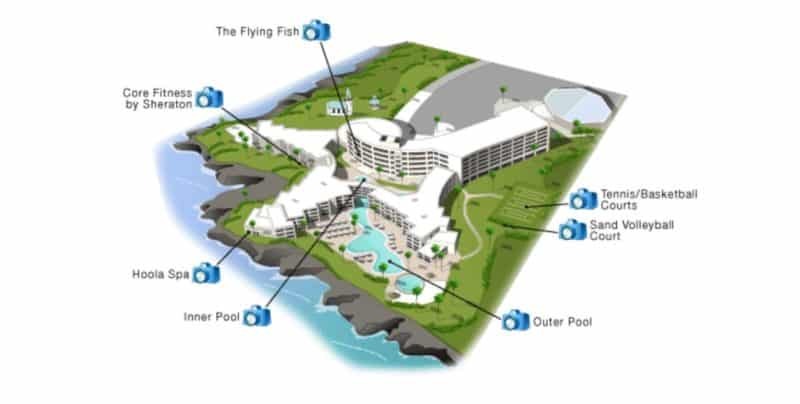 This resort is located on 62 prime oceanfront acres and features an impressive 1,240 guest rooms and suites. Luckily, they have an on-ground air-conditioned tram(!) to get around the resort grounds. The grounds also include two world-class golf courses, Three pools including waterfalls, a 175-foot water slide and an adults-only pool, and a lagoon with dolphins. 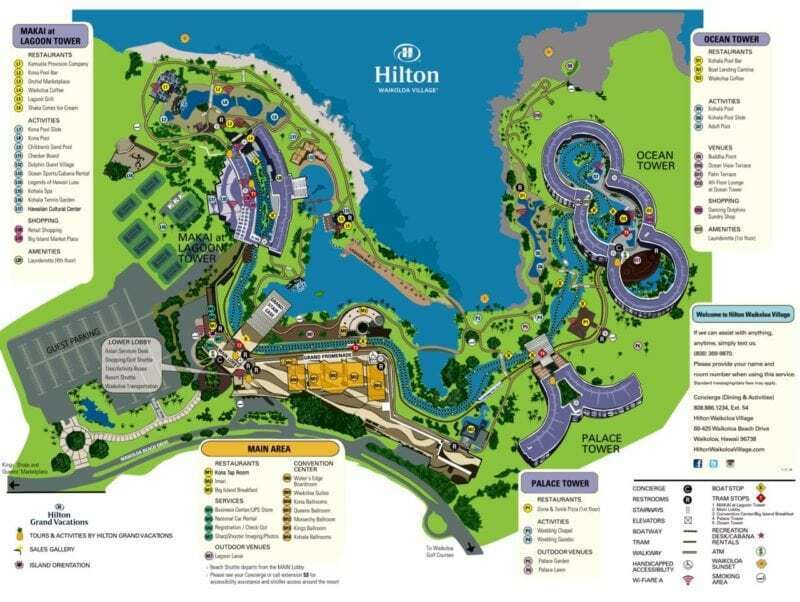 Read more on the Hilton Waikoloa website, or have a look at the resort map (updated March 2017) below. Mauna Lani Bay Hotel & Bungalows is one of the Waikoloa resorts with amazing access to the beach. The resort includes the luxurious Mauna Lani Bay Hotel & Bungalows, Mauna Lani Spa and the Francis H I’i. Brown Golf Courses. 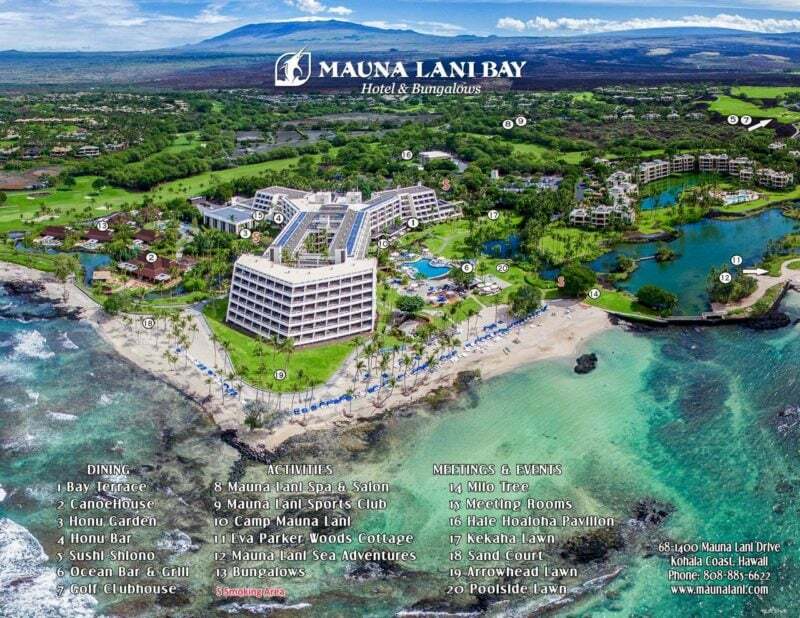 Read more on the Mauna Lani resort website, or have a look at the resort map (updated March 2017) below. The Fairmont Orchid resort is the most northern of the Waikoloa resorts. The resort is spread over 32 oceanfront acres and faces a sugar-white sandy lagoon and aquamarine waters. You can count on finding a year-round children’s program, a spa (without walls), golf, tennis, and six restaurants in the Fairmont Orchid resort. 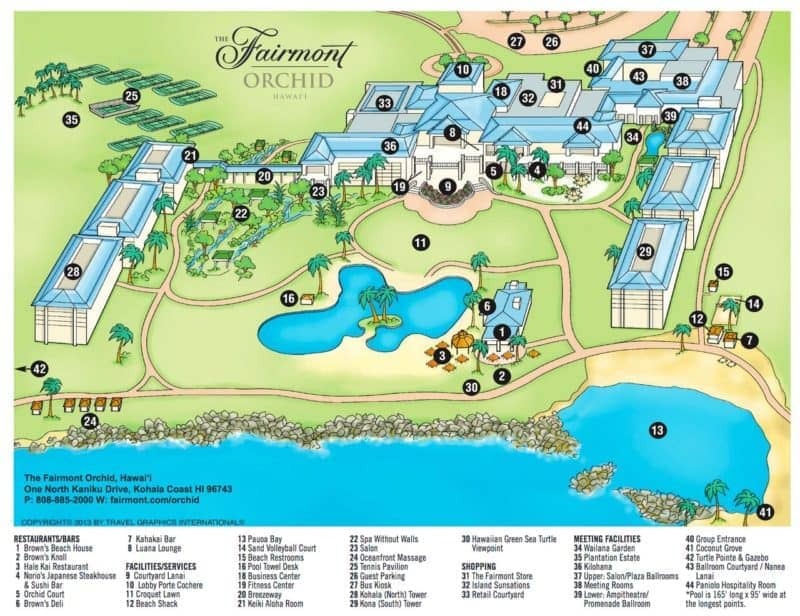 Read more on the Fairmont Orchid website, or have a look at the resort map (updated March 2017) below. The Hapuna Beach Prince Hotel was build on natural bluffs above the sea and overlooks the beautiful white sands of world-class Hapuna Beach. The resort offers stunning views of the Kohala coast, an 18-hole golf course, a pool with beach bar, spa and fitness center. 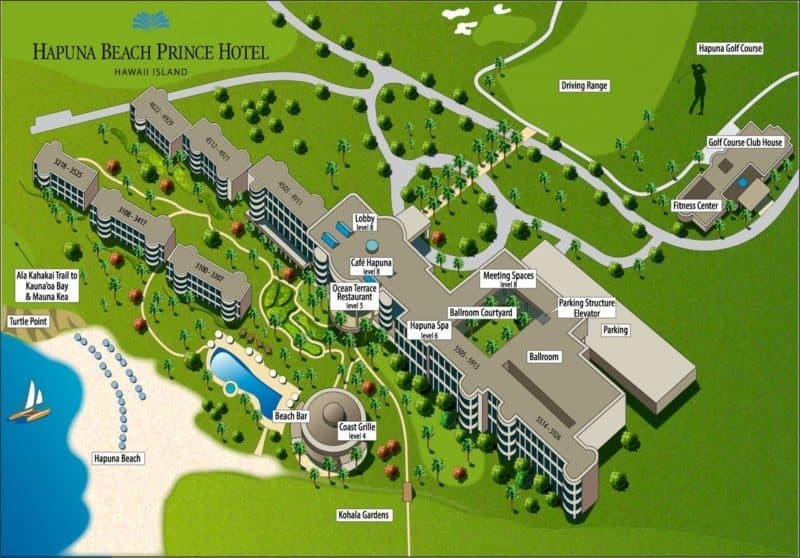 Read more on the Hapuna Beach Prince resort website, or have a look at the resort map (updated March 2017) below. 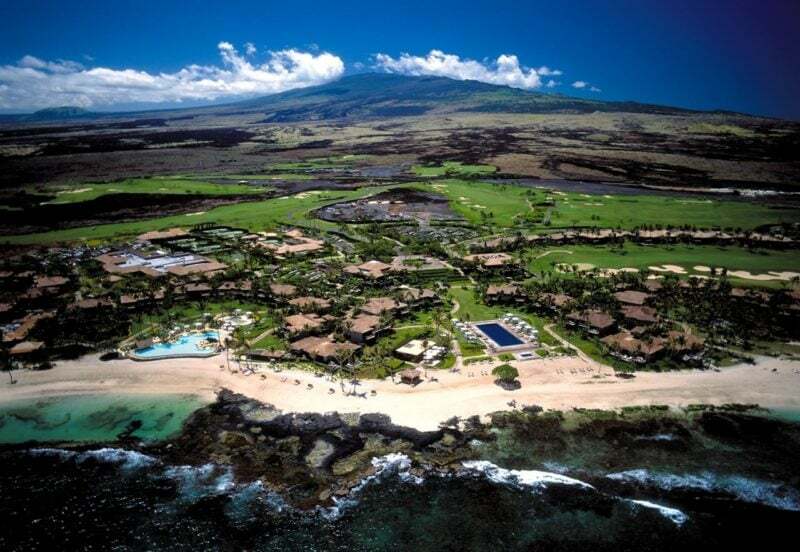 The Mauna Kea beach hotel is the first resort to be build on the Big Island and opened in 1965. The hotel was founded by noted conservationist Laurance S. Rockefeller on the shores of the perfect white sand crescent of the famous Kauna‘oa Bay. At the resort you have access to exceptional golf courses, tennis, ocean and cultural activities as well as serene and luxurious relaxation on the Big Island. Read more on the Mauna Kea Beach Hotel website, or have a look at the resort map (updated March 2017) below. Hilo is the capital of the Big Island but its location on the eastern side of the island make it a less-than-prime location for resorts: The beaches here are not as good as those in Kona and it is likely to rain almost every day. That also means, of course, that you are in the middle of the lush and tropical side of the Big Island, and at a very central place that allows you to explore the waterfalls, lava and volcanoes that are all close! 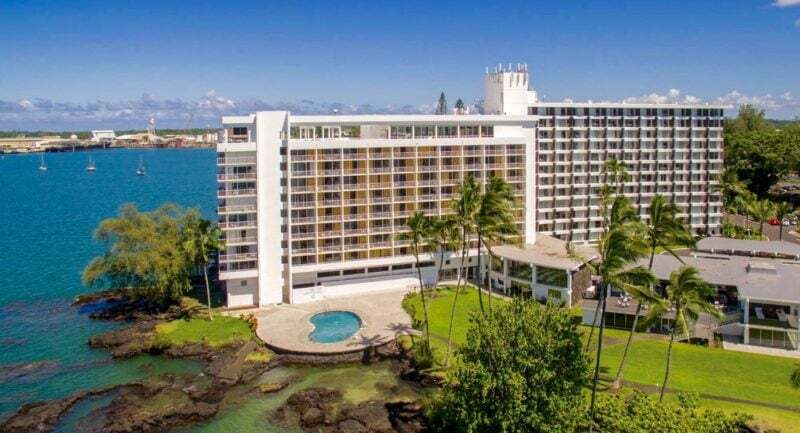 The Grand Naniloa was build amidst a lush, tropical landscape at a gorgeous oceanside location with magnificent views of Hilo Bay and Mauna Kea. Other strong points include convenient access to Hilo Airport (at ~2 miles), and an on-site golf course and swimming pool. On-site (very good!) restaurant with panoramic views of the Hilo bay. 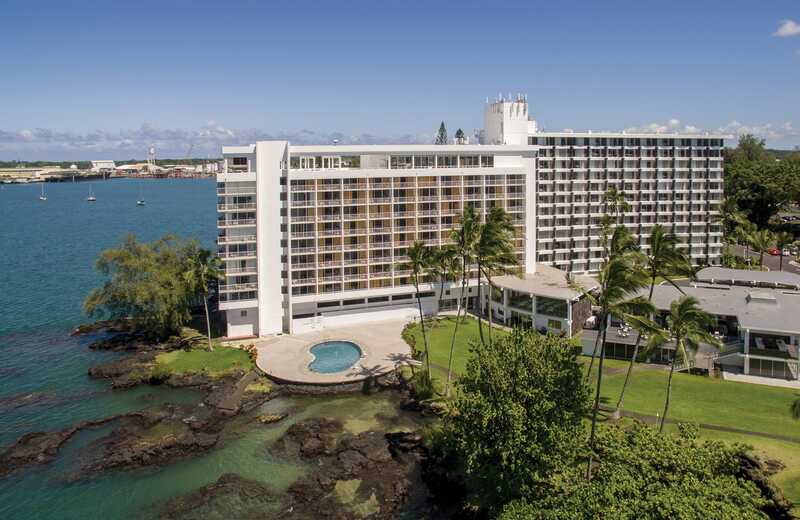 Aerial view of the Grand Naniloa Hotel Hilton in Hilo.